For the next few weeks, AFIEP will be on vacation. We're going to the West Coast, but bookending it with brief trips to Vermont. We'll drive up today, hitting the Southern Vermont crafts fair in Manchester as well as the fave diner in Bennington; tomorrow we'll fly to Oakland from Burlington. We enjoyed our Bay Area vacation last year so much that we decided to do it again. An added bonus, of couse, is that the weather there is apparently hovering around 68 degrees and sunny, so that denizens of that zone are probably frolicking in the lovely summer weather rather than baking alive as we've been doing here in the east. I'm packing a jacket or two for when the evenings get even cooler, hallelujah. As for the above pic (which I put in for you to have something pretty to look at while I'm gone), yes, even people who make homemade goodies all the time do frequent bakeries upon occasion. As a matter of fact, some of us (and I'm not saying whom) are known for our inability to pass a likely bakery by. This is actually a very good policy, especially when it's about a hundred degrees out. As a matter of fact, I recommend that in such weather, that's exactly what you do. Go into the nice air-conditioned bakery, try some free samples, and get some cakes or some tarts and some croissants and whatever else looks good. Girls and boys, please avoid lighting your ovens when the mercury goes above ninety. It's just not a pretty sight when your house heats up and everyone becomes more irritable than they already were. Even if you're handing around freshly-baked something-or-other. The picture is actually from a few Saturdays ago when I was at the Union Square Greenmarket. I noticed a shop across the way that was new to me. There were artful gold letters above the door which said Tisserie. "Tisserie?" I said to myself. "As in RO-tisserie?" But no, it was as in PA-tisserie. 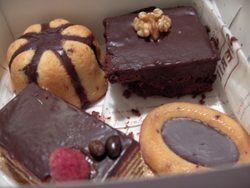 So instead of a roasted chicken, I brought home the box of goodies pictured above as well as some croissants and pains chocolats and such. The bakery is French-style, with some interesting South American resonances (apple pastelitos, for example), and has one other outpost in Venezuela. The NY shop is their second shop. Not everything is stellar, but the croissants were good, and that little oval cake filled with chocolate is excellent. It's called a cats' eye, and it's a kind of almond pain de Gênes with a little pool of ganache in the center. What could be bad? "Everything is for the best in this best of all possible worlds." "We must cultivate our garden." We were planning to go to Vermont this weekend to enjoy a little rural interlude and, incidentally, re-stock our nearly-depleted stores of Cabot cheddar cheese and cider jelly and baking staples from King Arthur. But the season of final exams is upon us. This means my services as a tutor to private school kids are much in demand at the moment, so I decided to stay home this weekend and make hay while the sun shines -- even if it is pouring down rain at the moment. Staying home on a holiday weekend really isn't such a bad thing, especially when lots of other people leave the city and things are a bit less crowded. 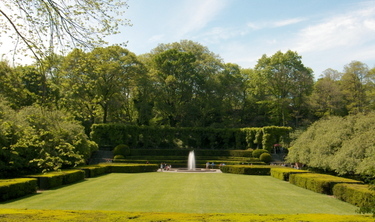 Extra especially is this true when the Conservatory Gardens of Central Park are a mere three blocks from your home. "Welcome to our backyard," we like to say when we bring visitors for a walk in the gardens. We usually enter at the front gate, so you can see the expanse of lawn with the fountain at the end as you enter the gardens. I won't only be tutoring this weekend. We have tentative movie plans, a Greenmarket to shop, and the Broadway Panhandler's moving sale to attend. 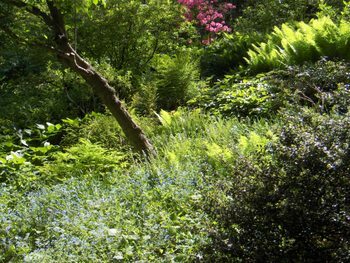 I'm also pondering the possibility of a lovely afternoon stroll, and perhaps even a couple of sandwiches and a jug of iced tea and some fruit and books and blankets to accompany us into our urban backyard. Stay tuned. Drive-by Blogging -- Or Not? It's not that I haven't been cooking. In fact, I've been cooking up a storm. But as always, I've also been doing everything else (school-consulting/teaching, taking stultifying administration classes for which they have us doing huge, undoable, unreasonable, useless projects, and in addition, tutoring for a little extra pay-puh, as the kids would say). On top of that, there's always helping out with dear old dad and keeping our own home fires burning. It seems to me that sometimes it comes down to a choice between cooking or blogging about cooking/eating. Then, of course, if I choose blogging over cooking, what will I blog about? Endless meals of cheap take-out? I think not. So cooking it is, but fear not. I hereby initiate drive-by blogging at AFIEP for those periods when I don't have time to post, but can give you a glimpse into our (sadly very messy) kitchen. Here's last weekend's bread, a delightful recipe that I found on the back of the package of no-less delightful cereal (available from King Arthur) called Pompanoosuc Porridge (and yes, of course, the name of the porridge has occasioned a flood of puns and merriment on the part of G). The porridge is a lovely mix of white bulgar wheat, finely chopped steel-cut oats, and flax seed. It's absolutely my new favorite hot cereal. 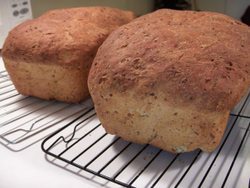 Once cooked up, you use a few cups along with KA's own White Whole Wheat Flour and bread flour to make these crunchy yet voluptuously wholesome loaves. Last weekend saw the beginning of a huge spate of baking, which has continued, as you'll see. I didn't take any other pics, but you'll simply have to take my word for it that in addition to the bread, I made two of Nigella's Dense Chocolate Loaf Cakes (using strong coffee instead of hot water in the batter), a large pan of Sour Cherry Streusel Cake (made with last year's sour cherries from the freezer) and a batch of what I've decided to call No-Brainer Bars -- a sort of quickie chocolate chip blondie. These last are such a fabulous cheat that they deserve their own post, so I'm saving the description for another day. All of this largesse was distributed to friends in Connecticut, where we went for Mother's Day lunch, as well as to my 8th grade advisory group and my fellow sufferers in my administration course (watch, I'm going to get dooced and thrown out of the admin program for talking about how terrible it is. Especially since it's a federally sponsored program, and they never tire of reminding us that we're getting our administrative licenses for FREE, whoo-hoo. I, of course, would argue that the cost of listening to most of these blatherers for FOUR HOURS every Tuesday evening is all too high). Like everyone else who tries to eat somewhat seasonally, if not entirely locally, I've been making quantities of asparagus lately: roasting, steaming, what-have-you. Last week I steamed three large and blooming bunches, and decided to turn some of these sweet green spears into another dish. 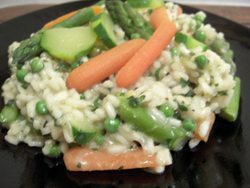 They found themselves nestling into this herb-and-vegetable-laden springtime risotto of arborio rice, leeks and shallots simmered to creaminess in vegetable stock, then melded with lightly steamed carrots and zucchini and a mince of fresh mint, basil, rosemary and parsley. Since it's so chock full of health-giving anti-oxidant veggies, this risotto couldn't possibly be bad for you, could it? What's a bit of rice (and a little butter and cheese and a tiny dab of créme fraîche) going to do to you, after all? This dish was originally intended for the last IMBB/WBW, to be paired with a delightful wine, Amethyst Winery's Malvasia Bianca Floralia 2001. But since I haven't yet been able to get ahold of the wine, and I couldn't get it together to post about the risotto in time, here it is in drive-by format for you. Or not. I'm noticing as I write this that it's not really a drive-by at all -- in fact, it's taking me quite as long as a regular post. I guess maybe it's a drive-by in the sense that it's basically a condensed version of what would have been several longer posts. Today's baking binge consisted of two items. First up was a eau-de-vie de framboise-scented poundcake, laced with berries, recipe courtesy of the lovely Molly at Orangette -- my only modifications to her recipe being that 1) I do preheat the oven, since mine doesn't seem to behave well unless I do, even with a slow-baked cake, 2) I use the framboise instead of kirsch, and 3) I add an extra teaspoon of baking powder, since, due to my uncooperative oven, I've had trouble in the past with poundcakes that didn't have quite enough leavening. Next up was a large panful of layered bar cookies. My hunch is that the poundcake will go over big on Tuesday night in my admin class, helping to pass time by sedating us all with butter and sugar during the interminable 4 hours. The bar cookies will be beloved by my 8th graders -- although I'm sure there will be some crossover between the two. The bars are part invention, part ancient history. 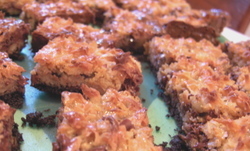 They're based on the cookie known variously as 7-Layer Bars, Hello Dollies, Magic Bars, and even Boy Scout Bars. You know the one -- graham cracker crust, nuts, chips and coconut in various arrangements depending on the recipe, with a can of condensed milk poured over all to glue it together while baking. I've been making them since I was in high school, when they assured instant popularity among the munchies crowd. A few years ago, I began boiling the cans of condensed milk to caramelize them before pouring them over the layers, which turned it all to lovely caramel. Today I took it a step further, and replaced the graham cracker crust with one made of Famous Chocolate Wafers. Graham crackers are beloved things, and I'm as fond as the next person of a good graham cracker crust -- but a chocolate wafer crust beneath the crunchy nuts and coconut, caramel chewiness and melting chocolate just about did me in. Even G, official hater of coconut although recent convert to coconut curries and rices, ate one. "That's really yummy," he said. "Really? You like it? It has coconut in it," I said with the customary smugness I use whenever I've tricked him convinced him to eat something he claims not to like. He looked at me fondly, with infinite patience, as one might look a deeply beloved but somewhat slow pet. "Yes, sweetheart, I know," he said.